NEW YORK (AP) — When fans tune into NBC’s Thanksgiving night broadcast of the Falcons-Saints game, they might do a double take. Rather than seeing Mike Tirico, Tony Dungy and Rodney Harrison in the studio for the pregame and halftime programs, those three will be calling the game. It’s nothing new for Tirico, who does play-by-play on Notre Dame games for NBC, spent years as the main voice on ESPN’s Monday night games, and has been working nationally televised contests on holidays since 2002. Dungy has worked in the booth before, too, including with Tirico. For Harrison, though, this is a first-time experience. “This is definitely unfamiliar territory for me,” says Harrison, who played 15 pro seasons at safety and won two Super Bowls. “I’m trying to figure what I want to talk about, how I want to focus on the offense or the defense. Mike tells me just to talk about what you see, that my being on the field and in the locker room as a player, just talk about what you feel like you want to talk about and have fun. There’s one thing Harrison definitely knows he won’t do. Dungy laughs when the Harrison remark is relayed. The Hall of Fame coach, like Harrison, is not one to pull his punches, but he also knows he can’t be wailing away verbally. What Dungy and Harrison can bring to the game is something not delivered by most NFL broadcasts: the perspective of the defense. So their critiques figure to be refreshing when you consider how many analysts in booths on the networks are former quarterbacks. “I think Rodney really will give some insight they do not really get elsewhere,” Dungy says. “Especially in a game like this, which will be so much of an aerial attack and passing. So, what should and can be done on defense to counteract it. In that area, I think we will both have good things to say. 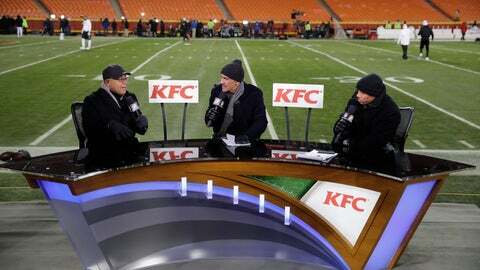 Tirico recognizes the importance of the comfort level the trio of announcers can carry into the broadcast. After all, they not only spend all of Sunday together, they also share thoughts via text or phone during the week. That can be a key for any broadcast crew. If there is any tension or animosity, it often is detected by the audience. “It’s a bit easier having the last couple of years together, or the few Thursday nights we worked on the field, being around the package when we had it,” Tirico says. “Every Sunday for the better part of 11 to 12 hours we are catching every game in the league and then doing the pregame show live and then watching the Sunday night game. And the viewers are certain to benefit.